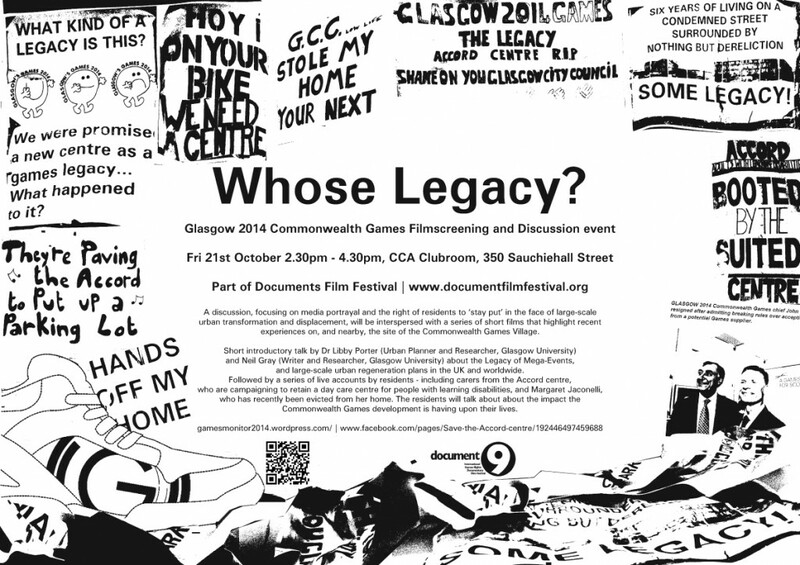 The Commonwealth Games 2014: Whose Legacy? Short introductory talk by Dr Libby Porter (Urban Planner and Researcher, Glasgow Uni) and Neil Gray (Writer and Researcher, Glasgow Uni) about the Legacy of Mega-Events, and large-scale urban regeneration plans in the UK and worldwide. A discussion will follow with a series of live accounts by residents – including carers from the Save the Accord centre, who are campaigning to retain a day care centre for people with learning disabilities, and Margaret Jaconelli, who has recently been evicted from her home. The residents will talk about about the impact the Commonwealth Games development is having upon their lives. Overview from a selection of design/other blogs. Disclaimer: collected by Neil. Go via this link and help raise funds for GSA. Please also support local bookshops such as Aye Aye (CCA), Analogue, Good Press etc. The views expressed on the Visual Communication blog are at the very most those of the authors, and possibly not even that. Any similarities to hyperlinks either live or dead are purely coincidental. * Are you a vis-com-des person?